The team takes a tour of their new digs at Mount Justice, and they go for a cruise in Miss Martian’s sweet ride. The team encounters Mister Twister, an obscure DC villain repurposed for the TV series. (Expect a lot of that in the upcoming episodes). We also get a glimpse of Snapper Carr, who is very different from the Supergirl version of the character, but closer to his comic book incarnation. We also get another scene of Roy Harper throwing a hissy fit, which you also should expect more of in future episodes. Is there going to be a lot more of Wally hitting on Miss Martian? That was the cringe-inducing bit for me. Is there going to be a lot more of Wally hitting on Miss Martian? I forget *exactly* how long that lasts, but I feel that was resolved in a satisfactory way later. Also, I should really join you guys on the rewatch. I'll totally sit down with this later. 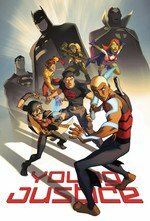 I miss Young Justice a lot. Recent DC animated outings have mostly been disappointing. I hate the new continuity of, like, Justice League: War and so on. Snapper was the dude with a soul patch. And yes, unfortunately, Wally goes on way too long with M'gan.